Former FEMA director Michael Brown is continuing to work at the Federal Emergency Management Agency at full pay, with his Sept. 12 resignation not taking effect for two more weeks, said Homeland Security Department spokesman Russ Knocke. CBS News Correspondent Gloria Borger reports that Knocke told her that technically Brown remains at FEMA as a "contractor" and he is "transitioning out of his job." The reason he will remain at FEMA about a month after his resignation, said the spokesman, is that the agency wants to get the "proper download of his experience." During that time, Brown will advise the department on "some of his views on his experience with Katrina," as he transitions out of his job, Knocke told the Associated Press. Brown also said Monday he should have sought faster help from the Pentagon after Hurricane Katrina hit, and accused state and local officials of constant infighting during the crisis, according to congressional aides. Brown spoke to congressional aides from both parties a day before he is scheduled to testify in front of a special House committee investigating the government's response to the Aug. 29 disaster. He did not respond to several calls for response Monday. Brown came to symbolize the halting federal efforts to rescue victims of the storm and flooding that followed in which more than 1,000 people died in Louisiana, Mississippi and Alabama. Homeland Security Secretary Michael Chertoff removed Brown from his on-site role overseeing the disaster response on Sept. 9. 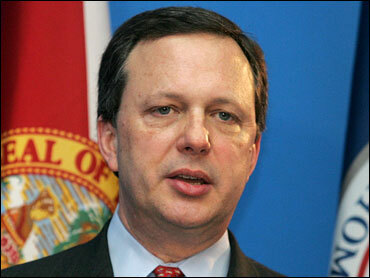 Brown announced his resignation from FEMA three days later. A memo from a Republican staffer who attended Monday's 90-minute briefing said Brown expressed regrets "that he did not start screaming for DoD (Department of Defense) involvement" sooner. The first substantial numbers of active-duty troops responding to the Gulf Coast were sent on Saturday, Sept. 3 — five days after the storm hit. According to the memo, obtained by The Associated Press, Brown took several shots at Louisiana Gov. Kathleen Blanco and New Orleans Mayor Ray Nagin. He said the two officials "sparred during the crisis and could not work together cooperatively." He also described Blanco as "indecisive" and refusing to cede control of the Louisiana National Guard to federal authorities because "it would have undercut her image politically," according to the memo. The document also criticized the conference calls with state and federal officials that Brown ran during the crisis, saying that no official notes were taken and that Brown "just assumed that agencies would follow up on taskings resulting from the calls." Brown defended himself against charges that he learned from television that thousands of refugees gathered at the New Orleans convention center, where adequate food, water and other supplies were lacking and there was rampant violence. He said that because the convention center was not a planned evacuation site, "there is no reason FEMA would have known about it beforehand," according to the memo. Brown also admitted he did not ensure that Nagin had a secure communications system during the crisis. Editor's Note: Another, earlier CBSNews.com story, the Hurricane Rita blog, reported information from the "Evening News" that Brown had been "rehired by the agency as a consultant." While technically accurate, this story's account is more precise and complete. The blog was updated as well to reflect Borger's additional reporting and clarification.